Hey everybody - this is my first post. Nice to be here. I am curious to everyone's opinions on this BR copy of "Pierrot Le Fou" being sold on Amazon by a third party (but "dispatched" by Amazon). I love this film and it will be my first Criterion Blu-Ray so I am hoping it is legit. Anyone have any experience dealing with this guy? There's no reason to suspect it isn't legit, and if it somehow did turn out to be a bootleg, you'd be covered under Amazon's return policy. Only a crazy person would bootleg Pierrot, there's about a billion copies floating around- I think Criterion purposely flooded it when they found out Lionsgate was going to take it back, because I've never seen a more plentiful OOP disc. I have yet to see a bootleg blu, actually- has anyone else? I figured that bootlegging 'Pierrot Le Fou' would be pretty absurd but you never know. Thanks for the peace of mind. I went ahead and ordered it. matrixschmatrix wrote: there's about a billion copies floating around... I've never seen a more plentiful OOP disc. I believe Amazon's never stopped selling new copies -- it's still available through them directly. matrixschmatrix wrote: I have yet to see a bootleg blu, actually- has anyone? Which blu-rays? The handful of Criterions......? There are probably hundreds of BR boots here by now. I don't do Blu, so don't check that often, and that's just what I can recall seeing. My dad has a bunch of bootleg BDs in Thailand, but when I actually inspected them, they were DVD-Rs with a Blu-ray logo stamped on them. Thailand (or your father) needs to keep up. The BR's here are indeed genuine fake Blus. Mostly newer films from the past 2 or 3 years. The BR price has dropped significantly here in the past year, as they've become more common. There are also plenty of Dvd-9 editions of BluRay releases. The covers have the BR logos, but nobody tries to sell them as BR's, just regular DVDs. You never see dvd-r's here in China. Even the real cheap editions and the super-compressed stuff, such as a whole season of The Simpsons on one disc, are put out with artwork and cover packaging, etc. There is enough of an established pirate industry that there are pirate brands, with their own logos, varying levels of quality, and even focus on different types of films. One or two even have/had an internet presence, but they tend to keep it on blogs so they can't be traced. abintra wrote: I'm curious. Were there any signs that something was off before opening it? You mentioned it was new right? I had forgotten I had posted this a while back and have since changed my screen name. No there wasn't signs that anything was off when I bought it. Everything looked legit to the naked eye. It was only by accident I noticed that when I held the disc under a light for some reason or another. I own, like many of you probably do, hundred's of Criterions and I instantly noticed that drop shadow on the disc. I eventually got it squared away with the seller on Amazon. The 'like new' part that I mentioned was from the seller's description of the item. It wasn't actually new, as in, sealed in the original shrinkwrap. I suspect a better way to have described it would have been to say "from a private home, little to no shelfwear", but whatever. Anyway, I eventually got my money back, I did keep the disc though because I wanted the film and I have not since yet found a copy of it used outside of Amazon Marketplace. I'm leery of there being more than one boot of this title out there, so I wont dare buy it again. However, oddly enough, around this time I bought a used copy of "Tales of Hoffman" at a local Exchange (which is a very reputable used CD/DVD/Videogame store in the Pittsburgh area) and noticed THE EXACT SAME THING. 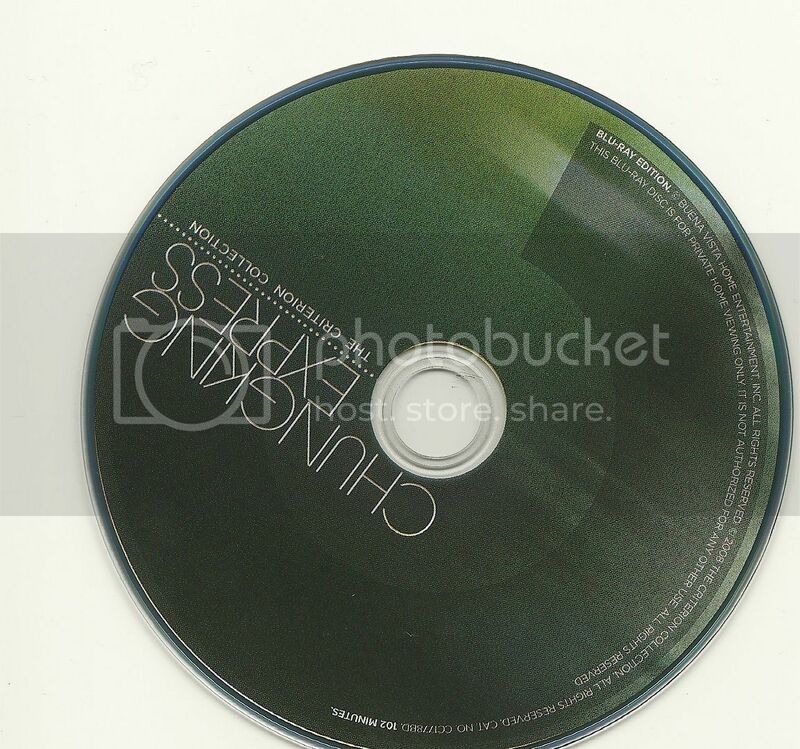 Again, it was an issue where you couldn't see the drop shadows until you held the disc up to a light source. The disc was a Playstation II disc underneath and you could see the lettering. I called the Exchange and spoke to their manager. He didn't know where it came from but I told him to keep an eye out for this in the future - especially with Criterions. Re: How to:... Criterion bootlegs Close-Up counterfeit? Can anyone who has a legitimate copy of Criterion's CLOSE-UP (DVD version) post the serials of the discs? I bought one that leaves me a tad dubious. It didn't come with the CC safety tape across the top. Any help is appreciated. Criterion doesn't manufacture their movies with the safety tape anymore. Anything you buy that still has the safety tape was probably pressed long ago and has been taking up shelf/warehouse space for a while. Thanks, I'm glad to hear that. What about the serials? These, now that I've looked at them, seem promising because they start with "cc" and there are two sets per disc. Bought a second hand copy of THE ROCK (hey, it was cheap) but it strangely won't play on my system. I checked the discs and the first one has a gold underside - have I bought a bootleg? kidc85 wrote: Bought a second hand copy of THE ROCK (hey, it was cheap) but it strangely won't play on my system. I checked the discs and the first one has a gold underside - have I bought a bootleg? Unfortunately, it sounds like you have. As the proud owner of nearly 400 Criterion discs, I can't recall a single one that wasn't the typical silver you see on most DVDs. Some have gold undersides. My copy of The Rock (the first disc), as well as In the Mood for Love are gold and I got them both on release date. Same with Armageddon. I know there's others as well but I'm not searching through them. That would just be crazy. To kidc85: it doesn't sound like a bootleg. It's probably defective. Does anyone know if there is a way to tell whether these are fake? I don't know if this is the right thread, but I can't find any place else to post this. 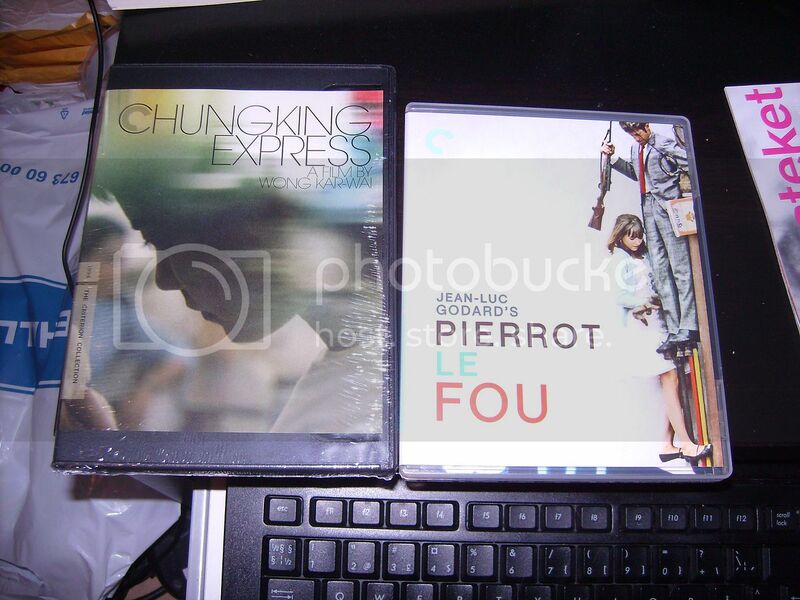 I got Chungking Express today from an Amazon-seller. It was the Blu-Ray edition and I recieved it today. However, I'm very suspicious about it for the moment. It was sold as "New" but what I got was the movie to the left, I used the right one just to demonstrate the seller what differences there are between the case I got and a real case for Criterion Blu-Rays. Of course, I understood that the item was not new and just a reseal. But when I opened the movie, I found the disc to look rather strange. Here is both sides of it. Notice the arrow on the back. The disc it white at the inner-edge (although it looks like it's black) which makes me think it could be a bootleg. 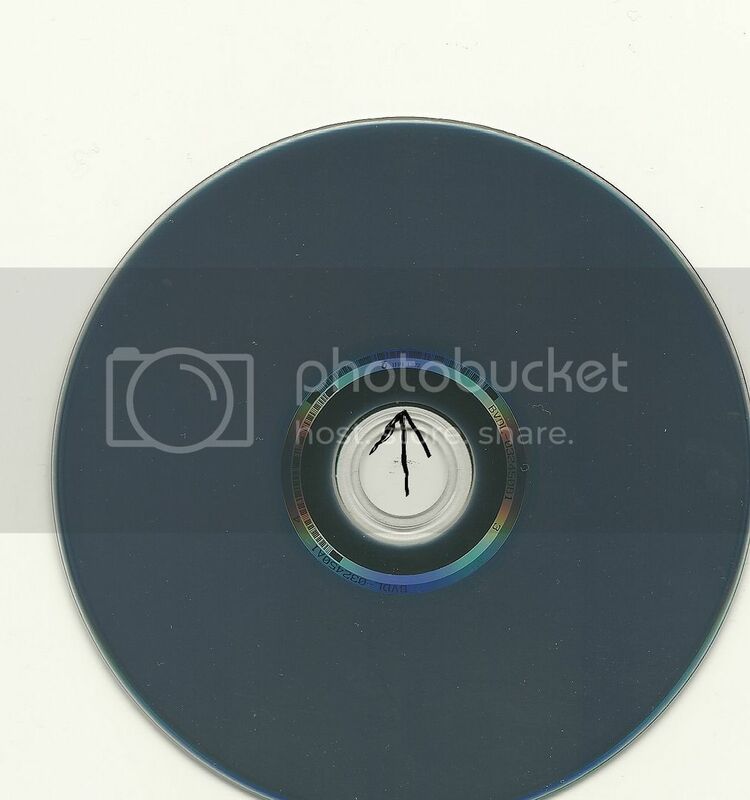 And on the front of the disc, look at the white edge on the bottom of the image and the small white/yellow part in the middle. The text isn't very sharp either, it's not completely white (rather a little yellowish and fuzzy). And next thing is the disc itself. At least it doesn't work on my region B-player which makes it seem more authentic, but the subtitles are a bit strange to me (since it's by Criterion). Here's a screenshot. Shouldn't the fonts be thinner since it's a Criterion-release? From what I can remember, none of my other Criterion Blu-Rays have this sort of font. Although, this is an early release so that might be the reason. What do you think? Could this be a bootleg or is it authentic? Are your copies of this movie like mine or what is this all about? I understand that the cover isn't real, but I feel so confused that a Blu-Ray like this would be a bootleg. My copy's disc is certainly not as grainy and hard to read on the front, and certainly not black on the back of it. Can't pop it in at the moment as I'm watching some region-B stuff today, but that packaging alone is pretty suspicious there, buddy. As i wrote, it's not black on the back, it's white. The picture is somehow incorrect but you get the point. About the packaging, someone obviously just took the cover and inserted it into a Dvd-case along with the disc and booklet and then resealed it. Although the seller says that all of their items are brand new and sealed by the manufacturers, which means that either the seller is a faker or just unaware of how a Criterion Blu-Ray should look like. nissling wrote: As i wrote, it's not black on the back, it's white. The picture is somehow incorrect but you get the point. About the packaging, someone obviously just took the cover and inserted it into a Dvd-case along with the disc and booklet and then resealed it. Although the seller says that all of their items are brand new and sealed by the manufacturers, which means that either the seller is a faker or just unaware of how a Criterion Blu-Ray should look like. I think you have the real deal. I compared my copy to yours and they look practically the same. Black border around the disc at the front and a slight white inner ring on the back. The serial numbers on the disc match as well. The only differences are the my store bought disc is gold in color (that could just be because of your lighting) and that the "IFPI L322" in the inner ring of mine does not have the little logo next to it and ends with "L321." Other than that, I'm sure you have a legit disc. I got The Long Good Friday yesterday and while the cover and such looks quite good, the bottom of the disc doesn't say anything else than "THE LONG GOOD FRIDAY. MADE IN TAIWAN". It doesn't have any mention about nimbus and the center of the disc is just transparent, not silver. I'll try to post some pictures soon but do you guys think it could be a bootleg? And when I had only one copy of Andrei Rublev, I was quite content. Although I have bought many discs from eBay and Amazon sellers, I had never considered that any of my CC discs might be anything other than legit. But now as the result of acquiring a mixed lot of discs, I have two copies of AR. Even though the packaging for both seems identical, the discs themselves are not. One disc has a silver reflective side -- the other is gold. The disc serial numbers are also very different. The gold disc has these serials: L810 7982 ARUBLEV0 T90110-04 Y and L810 7982 ARUBLEV1 T90109-08 Z. The silver disc has: IFPI L908 FR CC1550.1.A VA03 and IFPI L908 FR CC1550.1.B VC01. Is one of these not on the up and up?